Picture copyright Filippini et al. 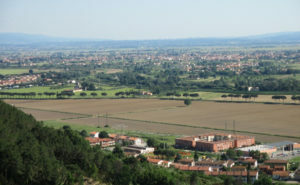 Periurban farming is central to the debate on food security in developed countries. Scientists Filippini et al. developed a methodology to characterize food quantity, quality and crop production intensity in periurban farms. They reckon that food allocation must be supported in local markets through specific agri-urban projects. Such novel analyses are essential to develop more efficient food policies with benefits for the urban food security. Urban farms can have positive social and ecological impacts on cities but their economic viability is a burning issue. Scientists Chang and Morel explored the economic viability of organic vegetables microfarms in London. 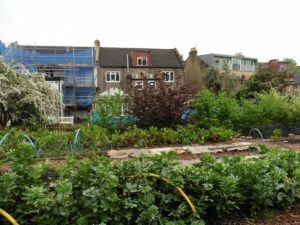 Although specific strategies at the farm level can increase the economic success of urban farms, engagement with the wider political context is needed to support the development of urban agriculture. Producing edible biomass on rooftops is a growing worldwide demand of large urban areas. Scientists Grard et al. achieved for the first time a quantitative assessment of several ecosystem services delivered by a productive green roof based on urban wastes. They show that low-tech productive rooftops, particularly easy to manage, allow the recycling of organic wastes and the production of vegetables by using rainwater but no chemical fertilizer. Picture copyright Dorr et al. 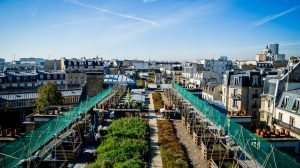 Urban rooftop farming is gaining popularity in European cities, although its impacts have rarely been quantified. Scientists Dorr et al. 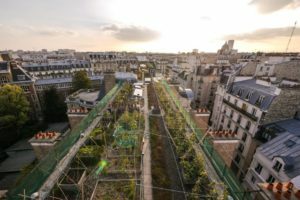 used Life Cycle Assessment to compare the environmental and economic impacts of producing 1 kg of lettuce or tomato under various substrate types in a rooftop garden in Paris, France. High-yielding lettuce plants had lower impacts than tomato, and systems using compost as a substrate had lower impacts than those using potting soil. Picture copyright Alfaro et al. 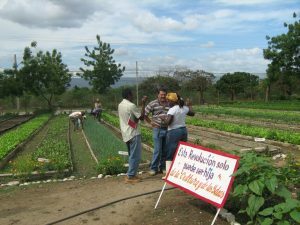 Cuba’s urban organic gardens, called Organopónicos, provide most of the fresh vegetables to local communities. However, urban organic inputs can be contaminated by trace elements affecting human health. Scientists Alfaro et al. showed, indeed, that compost produced from municipal solid waste were largely contaminated by cadmium and lead. Because of this investigation, the use of municipal solid waste compost for food production has been forbidden in Cuba. Picture copyright PENNISI et al. Urban gardens are rapidly spreading in cities because people want healthier, self-grown food. However, cities are often highly polluted by atmospheric pollutants. Soils used for plant growth may also contain heavy metals. Agronomists Pennisi et al. grew vegetables with and without soil and found that soilless vegetables contained 70% less chromium, 61% less copper, 45% less cadmium and 81% less nickel. They conclude that, unexpectedly, soil is the major pollution source of urban vegetables, not air. Farmland is increasingly being polluted by pesticides and also by vehicles, notably near urban areas. 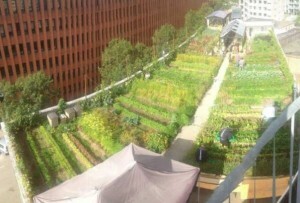 Since pollution is concentrated at low atmospheric levels, cultivating crops on rooftops may produce high-quality food. Agronomists Liu et al. 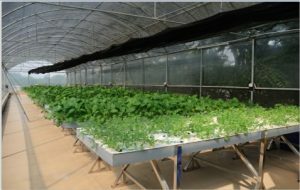 cultivated leafy greens in Guangzhou, China and found that rooftop grown vegetables were competitive in cost and quality compared to high-end market vegetables. 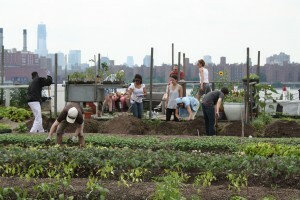 Is urban agriculture socially acceptable ? Urban agriculture is developing fast and attracting entrepreneurs. 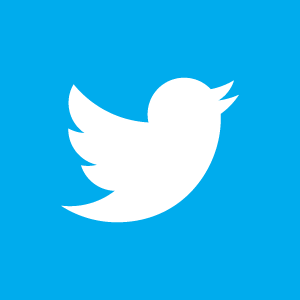 However little is known about the social acceptance of such businesses. Specht et al. surveyed citizen perception of agriculture in Berlin. They found that not all forms of agriculture are acceptable by citizens. Is urban farming really green? Picture copyright GOLDSTEIN et al. Is urban agriculture more environmentally friendly than conventional food production? 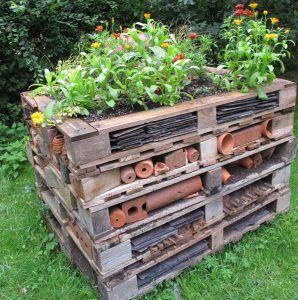 Urban agriculture is believed to decrease environmental impacts by reducing transport and packaging, recycling food waste and wastewater, and mitigating the urban heat island effect. Goldstein et al. review the various practices of urban agricuture to find support for the claimed benefits. The authors propose a taxonomy of urban farming systems. Picture copyright SANYE-MENGUAL et al. Industrial agriculture has led to many environmental and economic issues. As a result local production such as urban farming is a promising alternative, but the feaseability of urban farming has not been studied in details so far. Agronomists Sanyé-Mengual et al. grew lettuce, tomato, chilli pepper, eggplant, melon and watermelon on rooftop gardens in Bologna, Italy. 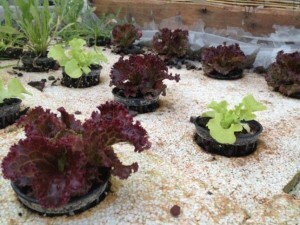 They found that floating cultivation of lettuce in the summer is better to address global warming. Soil cultivation of eggplant was the cheapest at 0.13 Euro per kg.